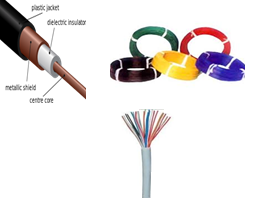 We have a wide range of products in this segment, We majorly deal with Electrical Cables & Wires, Cable Glands(PG), Switches, Relays,illuminated Push Button Indicators, MCB’s , Junction Box, Electrical Connectors,Connector Housing with wires crimped Sets, Metal Connectors. A cable is most often two or more wires running side by side and bonded, twisted, or braided together to form a single assembly, but can also refer to a heavy strong rope. In mechanics, cables, otherwise known as wire ropes, are used for lifting, hauling, and towing or conveying force through tension. In electrical engineering cables are used to carry electric currents. Electric cables discussed here are mainly meant for installation in buildings and industrial sites for power transmission at distances greater than a few kilometres see high-voltage cable, power cables, and HVDC. Electrical cables may be made more flexible by stranding the wires. In this process, smaller individual wires are twisted or braided together to produce larger wires that are more flexible than solid wires of similar size. Bunching small wires before concentric stranding adds the most flexibility. Copper wires in a cable may be bare, or they may be plated with a thin layer of another metal, most often tin but sometimes gold, silver or some other material. Tin, gold, and silver are much less prone to oxidation than copper, which may lengthen wire life, and makes soldering easier. Tinning is also used to provide lubrication between strands. Tinning was used to help removal of rubber insulation. Tight lays during stranding makes the cable extensible (CBA – as in telephone handset cords). A cable gland is more often known as a cable connector or fitting) is a device designed to attach and secure the end of a cable to the equipment. A cable gland provides strain-relief and connects by a means suitable for the type and description of cable for which it is designed—including provision for making electrical connection to the armour or braid and lead or aluminium sheath of the cable, if any. Cable glands may also be used for sealing cables passing through bulkheads or gland plates. In the context of consumer electronics, the term "DIN connector" commonly refers to a member of a family of circular connectors that were initially standardized by DIN for analog audio signals. Some of these connectors have also been used in analog video applications and for digital interfaces such as MIDI or the IBM AT computer keyboard (later PS/2 connectors for keyboard and mouse are Mini-DIN connectors). The original DIN standards for these connectors are no longer in print and have been replaced with the equivalent international standard IEC 60130-9.While DIN connectors appear superficially similar to the newer professional XLR connectors, they are not compatible. Connecting a Plug to an external electric power source (usually a normal electric wall socket). 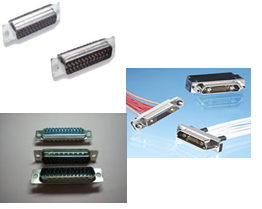 The Wire to Board Connectors is available in numerous varieties with various specifications. Wire to Board Connectors are offered guaranteed superior performance in any condition. - A micro switch is an electrical switch which can be operated using a very small force and also possibly using a small movement. Micro switch is a general term and not all micro switches use the same principle but most of them use a stiff metal strip supported by a spring which suddenly flips when a certain force on the switch button is applied. It flips back with a high speed too when the force decreases under certain limit. The switches use hysteresis so the activation force is higher than the deactivation force. Also the quick moving of the metal strip produces the typical clicking sound (known for example from computer mouse buttons). A Relay is an electrically operated switch. Many relays use an electromagnet to operate a switching mechanism mechanically, but other operating principles are also used. Relays are used where it is necessary to control a circuit by a low-power signal (with complete electrical isolation between control and controlled circuits), or where several circuits must be controlled by one signal. The first relays were used in long distance telegraph circuits, repeating the signal coming in from one circuit and re-transmitting it to another. Relays were used extensively in telephone exchanges and early computers to perform logical operations. A type of relay that can handle the high power required to directly control an electric motor or other loads is called a contactor. Solid-state relays control power circuits with no moving parts, instead using a semiconductor device to perform switching. Relays with calibrated operating characteristics and sometimes multiple operating coils are used to protect electrical circuits from overload or faults; in modern electric power systems these functions are performed by digital instruments still called "protective relays". Push Button Switches are manually operated switches that are available in many different types: Switches with round or square bodies for mounting in round or square holes, lighted and non-lighted Switches, Indicators, Selector Switches and Suitable Knobs.